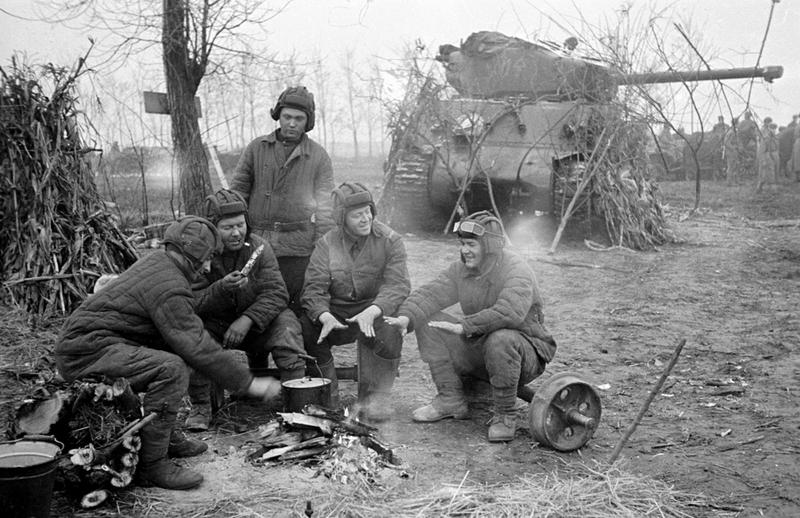 The 1st Baltic Front tankers having a rest near the Sherman tank, supplied under Lend-Lease by the US. This month marks 75 years since the United States launched its Lend-Lease program to supply the Allies with much-needed war materiel for the fight against Hitler. Downplayed by the Soviet Union, the program was of vital importance to the USSR’s war effort, as even Marshal Zhukov later admitted. On March 11, 1941 American President Franklin D. Roosevelt signed the Lend-Lease bill, which permitted the U.S. to supply its anti-Hitler coalition allies with materiel. "Now they say that the allies never helped us, but it can't be denied that the Americans gave us so many goods without which we wouldn't have been able to form our reserves and continue the war," Soviet General Georgy Zhukov said after the end of WWII. "We didn’t have explosives, gunpowder. We didn’t have anything to charge our rifle cartridges with. The Americans really saved us with their gunpowder and explosives. And how much sheet steel they gave us! How could we have produced our tanks without American steel? But now they make it seem as if we had an abundance of all that. Without American trucks we wouldn’t have had anything to pull our artillery with." The history of Lend-Lease began on May 15, 1940 when UK Prime Minister Winston Churchill asked Roosevelt to temporarily give Britain 40-50 old destroyers in exchange for British naval and air bases in the Atlantic Ocean. The Americans remembered a law from 1892 in accordance with which the defense secretary can "lease army property for a maximum of five years if the country does not need it." Based on this law a supply program was developed, which Roosevelt signed into law on March 11, 1941. According to the program, American materials "destroyed, lost or used during the war were not subject to payment." What had to be paid for was the property that remained after the war and was used for civilian purposes. Soviet leader Joseph Stalin decided to join Lend-Lease soon after Hitler's Germany invaded the USSR in June 1941. "Your decision, Mr. President, to give the Soviet Union an interest-free credit of $1 billion in the form of materiel supplies and raw materials has been accepted by the Soviet government with heartfelt gratitude as urgent aid to the Soviet Union in its enormous and difficult fight against the common enemy – bloodthirsty Hitlerism," Stalin wrote to Roosevelt. The first convoys with American goods were already being sent to the USSR by August 1941. Shortly afterwards the Germans found out about the convoy routes, and the allies suffered great losses. During the war Nazi submarines and torpedoes sank about 80 cargo ships destined for the USSR. More than 14,000 U.S. airplanes, 8,000 of which came from Alaska, were given to the Soviet Union in the course of the war. The USSR received a total of 44,000 American jeeps, 375,883 cargo trucks, 8,071 tractors and 12,700 tanks. Additionally, 1,541,590 blankets, 331,066 liters of alcohol, 15,417,000 pairs of army boots, 106,893 tons of cotton, 2,670,000 tons of petroleum products and 4,478,000 tons of food supplies made their way into the Soviet Union. And yet, during the war the Soviet government diminished the role of foreign aid. This made U.S. Ambassador to the USSR William Standley indignant. "It seems that the Russian government wants to hide the fact that it receives help from outside. Obviously it wants to ensure its people that the Red Army is fighting this war alone," he said during a press conference in March 1943. "After stormy five-hour telephone talks the Russian censorship allowed Standley's text to be published," the BBC's Moscow correspondent Alexander Werth later recalled. After the end of WWII the U.S. asked countries to pay for the civilian supplies they received (steamboats, trucks, power plants). The U.S. believed that the USSR had to pay $1.3 billion, yet Soviet government officials said they could only pay $170 million. Obviously, the U.S. did not accept these conditions, which led to talks in 1972 at which the two countries signed an agreement whereby the USSR was obliged to pay the U.S. $722 million by 2001. In the course of the following year the Soviet Union paid $48 million, but due to the American Jackson-Vanik amendment the Soviet Union ceased the payments. The amendment restricted trade with countries that impeded emigration and violated other human rights. One of the reasons for Washington introducing the amendment was the USSR's refusal to let Jews out of the country. In 1990 America and the Soviet Union returned to the talks. It was decided that by 2030 America would receive $674 million. A year later the USSR collapsed. But in 1993 the Russian government announced its succession to the debts and soon paid for all the goods that the USSR had received in accordance with the Lend-Lease bill. A full version is available in Russian.